The great playwright Eugene O'Neill looms as large over Woody Allen's latest film as the giant Ferris wheel that dominates the movie's Coney Island setting. 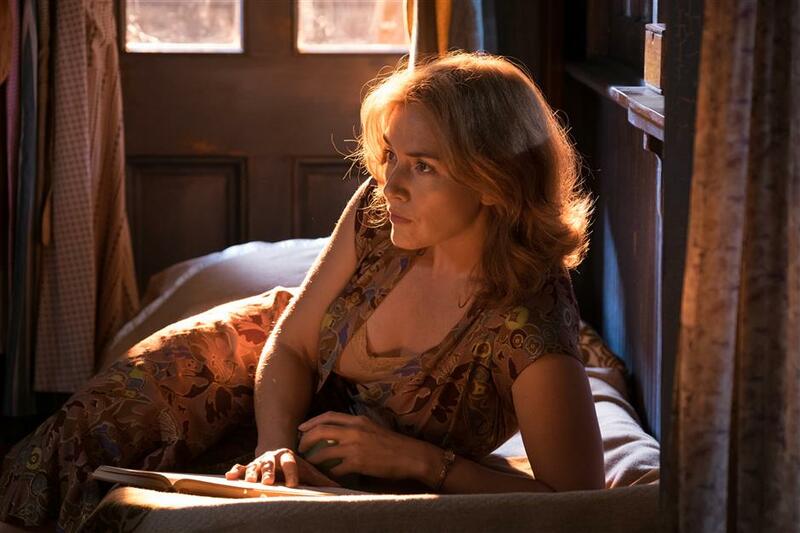 Kate Winslet in a scene from "Wonder Wheel"
It’s not exactly clear whether “Wonder Wheel” is an ambitious homage to O’Neill or a blatant theft of his work. Either way, it will be hard going for even the biggest Allen fan. It’s pitch dark, with little of Allen’s signature quirk and plenty of stilted dialogue. “Oh God, spare me the bad drama!” one character wails at the end and you’ll commiserate. O’Neill has always been held in high regard by Allen and he’s evidently borrowed so much from the master that what begins as a period drama set at the Brooklyn seaside just after World War II slowly transforms into O’Neill’s “Long Day’s Journey Into Night,” complete with a family at each other’s throats, alcoholic numbness and the lady of the house half out of her mind, trying on an old gown. A struggling blue-collar couple played by Jim Belushi and Kate Winslet, and two younger characters, Juno Temple as Belushi’s estranged daughter, and Justin Timberlake as a wannabe playwright and summer lifeguard who becomes a love interest to both women. There’s also a young son who is a firebug — and a cliche. The film feels more like an old play exercise retooled for the big screen. Allen uses Timberlake as the narrator — “Let me fill you in on that” — and he turns toward the camera often to address the plot and his role in it, a device that grows weary. Allen has made Timberlake increasingly unreliable. But he warns us early that it may happen when the young hunk explains that he loves melodrama and larger-than-life characters. “My tragic flaw is I’m too romantic a character,” he says in a delivery as wooden as the boardwalk. It’s not Timberlake’s fault — Allen makes him talk in a highly mannered manner, like a trying-too-hard playwright. “The heart has its own hieroglyphics,” Timberlake says. Winslet, playing a onetime-actress now hard-bitten waitress at a clam shack, falls for Timberlake’s much younger character. She, too, indicates to him that she’s unreliable, just playing a part. “I’m acting,” she says. Allen opens this strange door and then abandons it, although there’s a wonderful moment when we realize Timberlake has begun lying to us when he becomes infatuated by Temple’s character. He fits oddly in the film, a walking and talking cinematic device who gradually becomes subsumed by the family he’s helping rip apart. Belushi is perfectly cast as the blustery, bully husband, but his character’s weird adoration of his pretty daughter may strike some viewers as hitting a little too close to home (Allen had an affair with his then-partner’s adopted daughter, now his wife). As the summer love triangle heats up, the movie gets darker and more tragic. One bright spot is a mini-“Sopranos” reunion when Tony Sirico and Steve Schirripa show up as mobsters. Another is the soundtrack of jazzy pop from the era, beautifully integrated. Another plus is production designer Santo Loquasto’s beautiful recreation of a weather-beaten Coney Island, complete with a Ferris wheel that slowly turns but goes nowhere. It’s a fitting symbol for characters who might as well be on their own hamster wheels. Despite a stunning performance by Winslet and some beautiful cinematography by Vittorio Storaro, “Wonder Wheel” loses its charms quickly and you’ll soon be begging to get off this particular ride. Did you really think you wouldn’t get ripped off during a visit to Coney Island?